(Bloomberg) -- The road leading to this year’s New York International Auto Show was packed with a long convoy of SUVs. 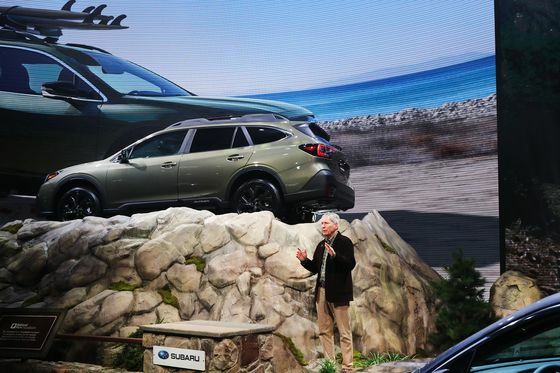 Toyota, Lincoln, Mercedes-Benz, Hyundai and Subaru kicked off the festivities Wednesday with five introductions of all-new or refreshed sport utility vehicles, one after another. Automakers are peppering American showrooms with fresh product for SUV segments, as the industry is coming off a year in which demand was strong whether they were hawking compact crossovers or big brute utes. Passenger cars cratered to a record low of roughly 30 percent of industry sales, and that share may still have further to drop before bottoming out. It’s back to the future for Subaru Corp.’s best-selling Outback crossover, which adds an optional turbocharger for the first time since 2009. The extra oomph boosts horsepower to 260 compared with the standard engine’s 182. A turbo also will likely improve fuel economy on the sixth-generation all-wheel-drive vehicle, though the Japanese carmaker has yet to announce estimated miles per gallon. Nodding to the love the Outback gets from owners, Subaru made few major visible changes to the exterior metal or extensive plastic cladding it proudly says is meant to resemble a hiking boot. Even so, it added features designed to fend off rivals such as the Honda CR-V and Toyota RAV4: a new hands-free tailgate, a tablet-style 11.6-inch touchscreen, and a driver-facing camera that triggers warnings if it detects a drowsy or distracted driver. And, yes, the prominent roof rails still come standard. 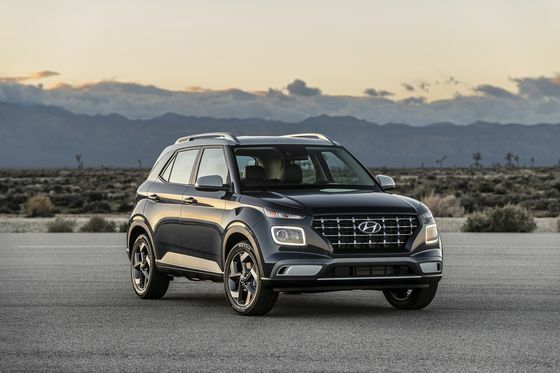 Hyundai Motor Co. has been working to catch up with consumers’ shift to SUVs by infusing its sedan-heavy lineup with a fuller selection of crossovers. The Korean automaker worked to generate buzz for its latest entry -- the subcompact Venue SUV -- with Times Square billboards two days before its official introduction at the show Wednesday. The Venue is sharing the stage in New York with the U.S. debut of the redesigned Sonata sedan, which suffered a 20 percent sales plunge last year and stands as a painful reminder of the brand’s dependency on traditional cars. As Hyundai’s seventh new SUV, the Venue gives the automaker a subcompact model below its $19,990 Kona with an aim of drawing young buyers to the brand. It has bulldog styling and an 8-inch color touch screen with Apple CarPlay compatibility. For buyers willing to shell out more, it has optional advanced safety technology including forward-collision avoidance and automatic emergency braking. Goodies aside, the Venue is all about value and its biggest attribute may just be its rock-bottom price. Daimler AG’s Mercedes is bringing out a revamped version of the GLS, the biggest SUV in its lineup, to claw back the sales lead won by rival BMW in this year’s first quarter. 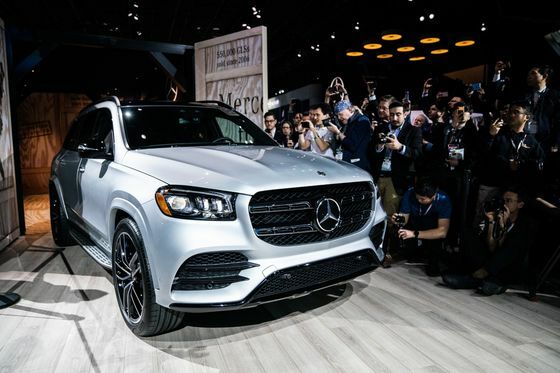 While Bayerische Motoren Werke AG is skipping this year’s New York show, Mercedes is taking the time to show off its Alabama-made three-row SUV, one of several new or refreshed vehicles coming this year. The German brand was in need of a product revamp, particularly for the aging GLE and GLS utilities. The U.S. luxury market is already losing steam, and while Mercedes has been the top seller for the past three years, its sales fell 9 percent through March. North American CEO Dietmar Exler will count on fresh products to reinvigorate sales while electrification costs and trade threats eat into the company’s profits. All right, there is at least one passenger car to talk about, but technically General Motors Co. showed off the Cadillac CT5 sedan Tuesday before the show’s official start. The car essentially replaces the current CTS and will be priced to compete with the Audi A4 and BMW 3 Series sedans. It’s a tough segment: Luxury sedans have been hit by both a migration to crossover SUVs and the popularity of Tesla’s Model 3 sedan. Tough market aside, the car is essential for the brand, Cadillac President Steve Carlisle said. The CT5 has an optional twin turbo V-6 engine with 335 horsepower. It will offer Cadillac’s Super Cruise in 2020, giving drivers the ability to go hands free on the highway. The CT5 will go on sale this fall, joining two SUVs: the XT4, which came out last year, and the XT6, which goes on sale this summer. The CT5 should be popular in China, where Cadillac got more than half its global sales last year, Carlisle told Bloomberg Television. Cadillac has another big change coming, Carlisle said in an interview. The brand’s sleepy “Dare Greatly” ad campaign will soon be gone. The campaign didn’t say enough about what Cadillac is and didn’t speak specifically enough about the vehicles, Carlisle said. “It’s time to let Cadillac be Cadillac,” he said. 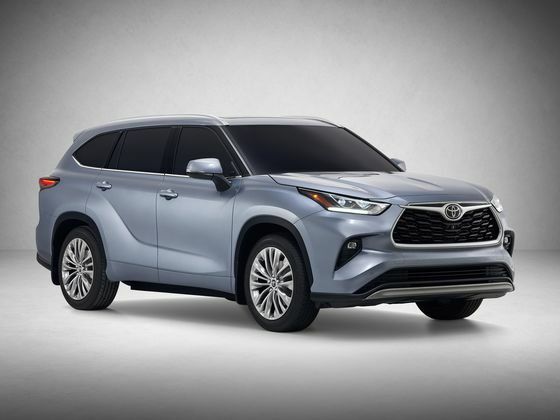 Toyota Motor Corp. is upping the ante in the competitive mid-size SUV market with its latest Highlander, recasting the three-row kid hauler with a new-look exterior and an optional 12.3-inch touchscreen inside that will be biggest in the segment, according to the company. The fourth generation of the SUV is 2.36 inches longer, increasing cargo area and boosting legroom between the second and third rows. Toyota also upgraded the available hybrid powertrain by increasing fuel efficiency by 17 percent over the previous generation to an estimated combined 34 miles per gallon. All these tweaks to one of Toyota’s most popular U.S. models will help Highlander stay strong in an increasingly crowded segment, with old rivals including the Honda Pilot now having to duke it out with new challengers such as the Subaru Ascent, Hyundai Palisade and Kia Telluride. 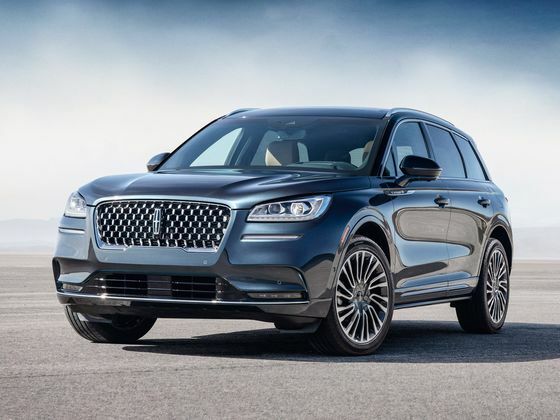 Ford Motor Co.’s long-lagging luxury brand is trying to build off its hit Navigator SUV with a winner for the entry-level segment where buyers first step up to premium models. It’ll be a tall order for the new Corsair crossover debuting at this week’s show. German and Japanese offerings like the Audi Q5 and Acura RDX outsell Lincoln’s MKC -- the compact SUV that Corsair is replacing -- by 3-to-1. Ford reckons keeping the price low and going higher tech with Corsair will help whittle down the average age of Lincoln buyers from 63, which is about a decade above the industry norm.